You’re at the place where Condor Flats and Grizzly Peak meet. A billboard advertises “Condor Flats Air Tours.” An airplane features the same brand on its tail. 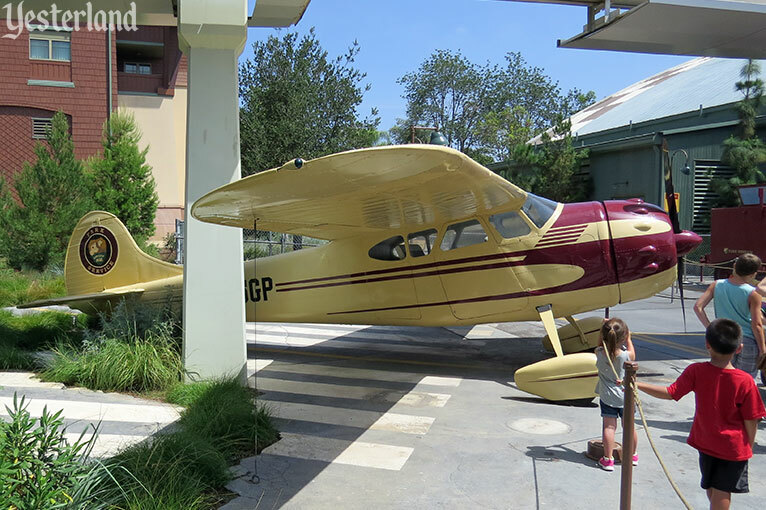 Is this air tour a park attraction? No. The airplane is just here to let guests know that Condor Flats is an airfield. The billboard is another opportunity for a pun. After all, Yester California Adventure is the Punniest Place on Earth. There’s a backstory. Here’s the modified Yesterland version of it. Condor Flats, an airfield in California’s high desert, is one of the birthplaces of the state’s aerospace industry. From its narrow runway, pilots risked their lives to test new aviation designs—from the earliest propeller-driven flying machines to experimental supersonic jets. Eventually, even rocket engines were tested here. Then, Condor Flats was a victim of the aerospace layoffs of the 1960s. A pilot—who called himself retired but had actually lost his job in the layoffs—returned to Condor Flats to start Condor Flats Air Tours. Running his business out of the old hangars that dated back to the earliest times of Condor Flats, he offered scenic flights to tourists. One hangar became the restrooms. An even older hangar became a gift shop, complete with a fancy lighted sign. The pilot dreamed of some day buying Howard Hughes’ H-4 “Spruce Goose,” the largest airplane ever built, and using it for sightseeing flights along the California Coast. He had shirts printed for his souvenir shop, but that’s as far as that dream ever got. He had a small, single-engine propeller plane for his business. He needed passengers more than he needed a larger plane. 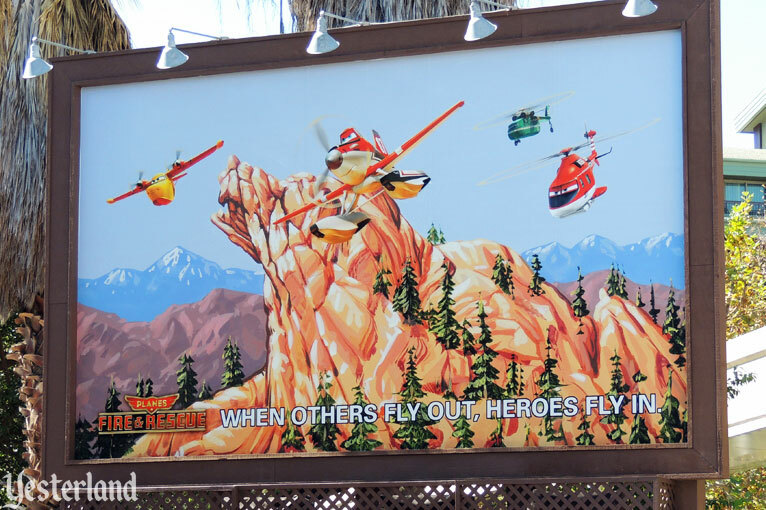 Condor Flats Air Tours billboard. To draw tourists, the pilot erected a billboard. For some inexplicable reason, Condor Flats Airfield is right at the base of a mountain, despite the vastness of California’s high desert. That mountain, Grizzly Peak, looks like the head of the extinct California Grizzly Bear, so it made a striking sign. After a few years, the pilot figured out that he could make more money from the billboard by occasionally selling the space to a movie company—even if it meant that nobody would see his logo in the lower left corner. 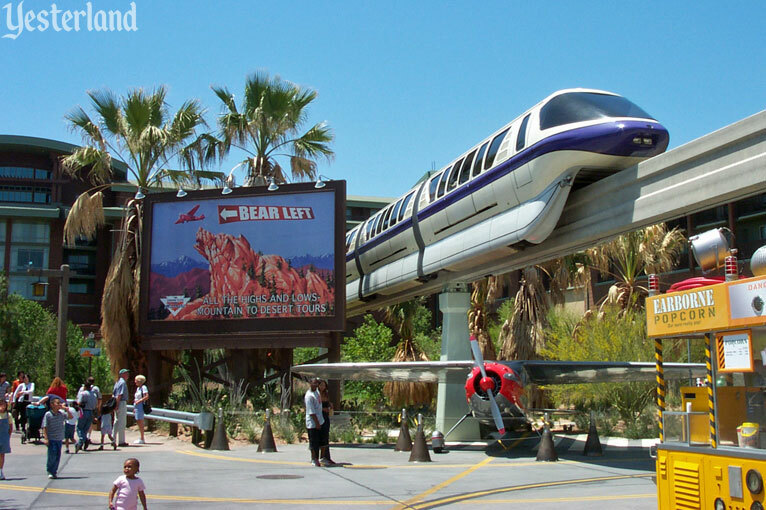 He always insisted on retaining Grizzly Peak as part of the billboard image, a familiar landmark near his hangars. The first movie advertised was Brother Bear. 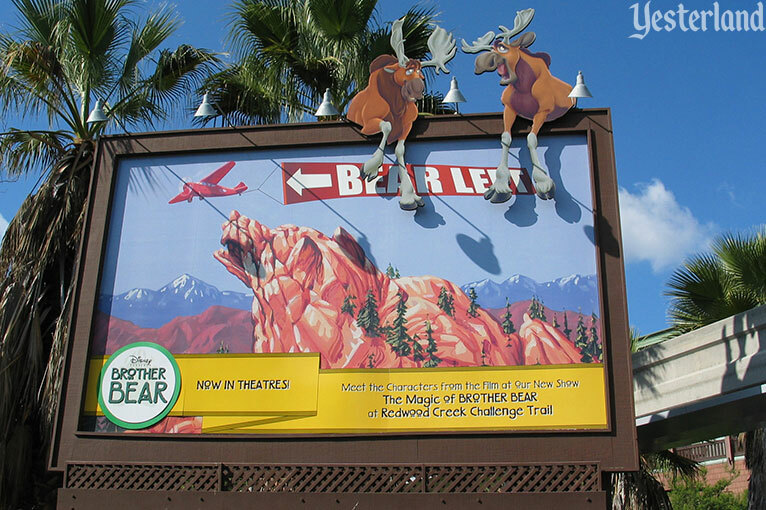 The 2003 release from Walt Disney Feature Animation was “the story of a boy who became a man by becoming a bear.” Rutt and Tuke, the two comic-relief Canadian moose from the movie, were perched at the top of the billboard. Nearby, bears Kenai and Koda apparently mistook California’s Redwood Creek Challenge trail for the Canadian Rockies. The pilot was eager to earn more movie advertising revenue. 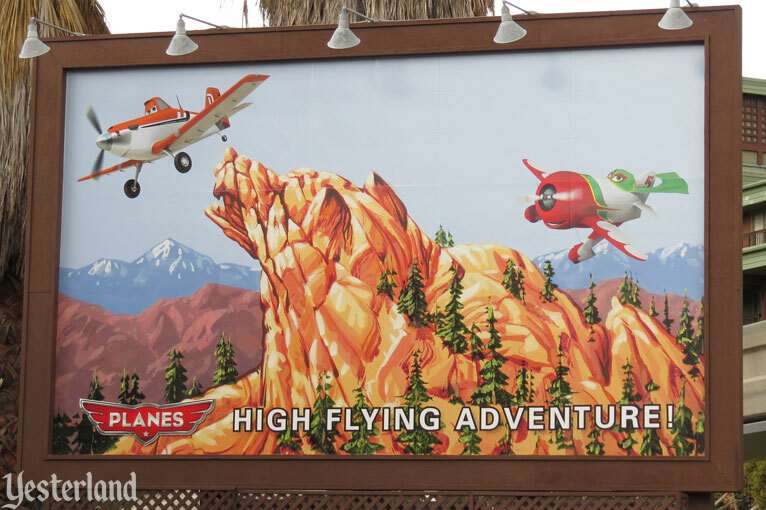 Sadly for him, Disney movies such as Meet the Robinsons, The Princess and the Frog, Tangled, and Wreck-It Ralph didn’t lend themselves to a Grizzly Peak billboard treatment. 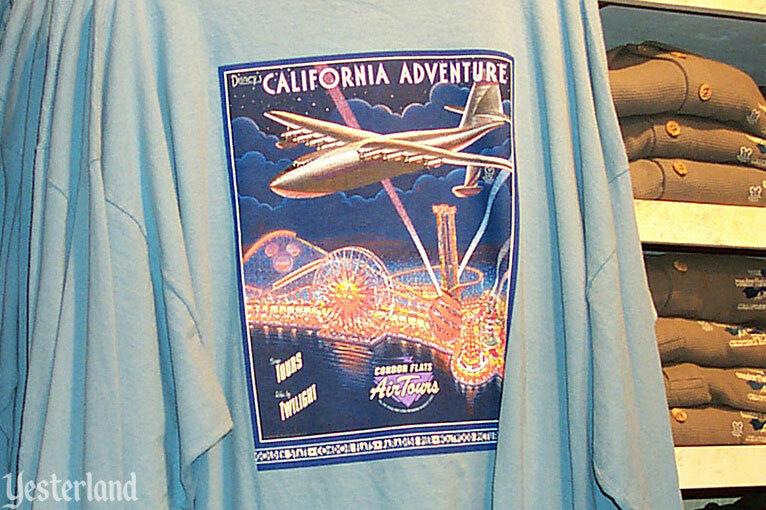 For almost ten years, he just advertised Condor Flats Air Tours. 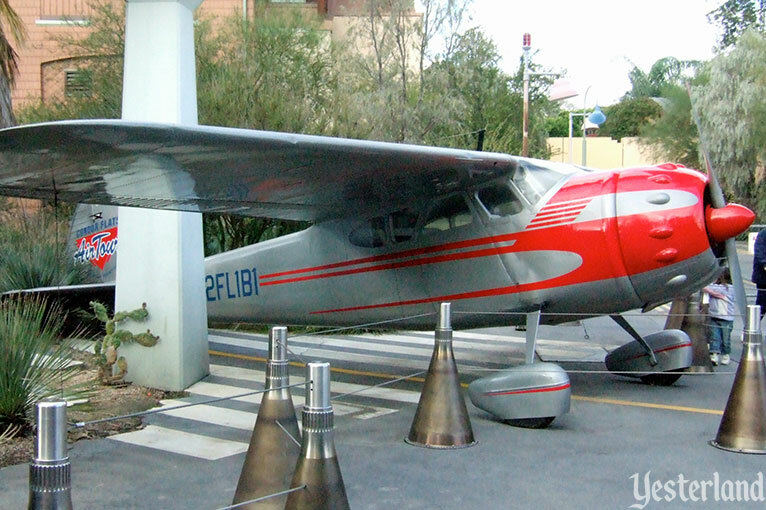 Then the perfect movie came along, Disney’s 2013 Planes. Some people mistook it for a Pixar movie because of its roots in Pixar’s Cars franchise. Dusty Crophopper, a cropdusting plane with a fear of heights and a dream of racing, looked good with Grizzly Peak. The pilot didn’t have to wait as long the next time. In 2014, Disney released Planes: Fire & Rescue, the second movie in what is expected to be the Planes trilogy. 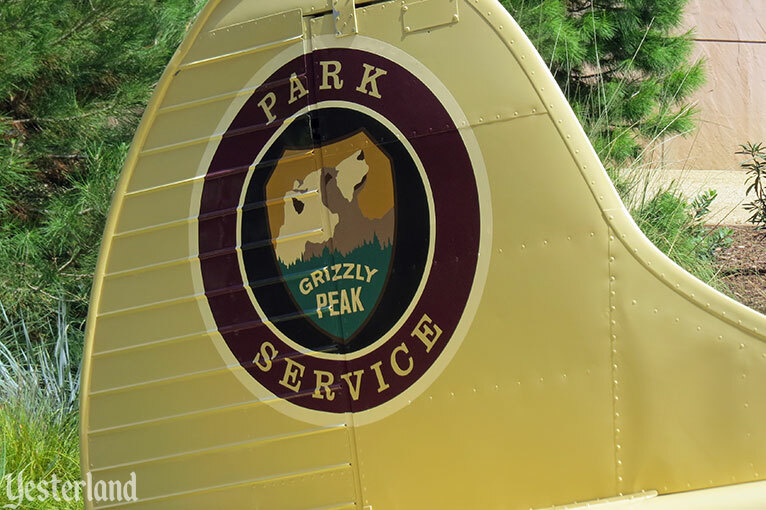 Although the movie’s aerial firefighters protected Piston Peak, not Grizzly Peak, it was another good fit. But will the final movie in the Planes trilogy make it onto the billboard? After all, Condor Flats is now in Yesterland. 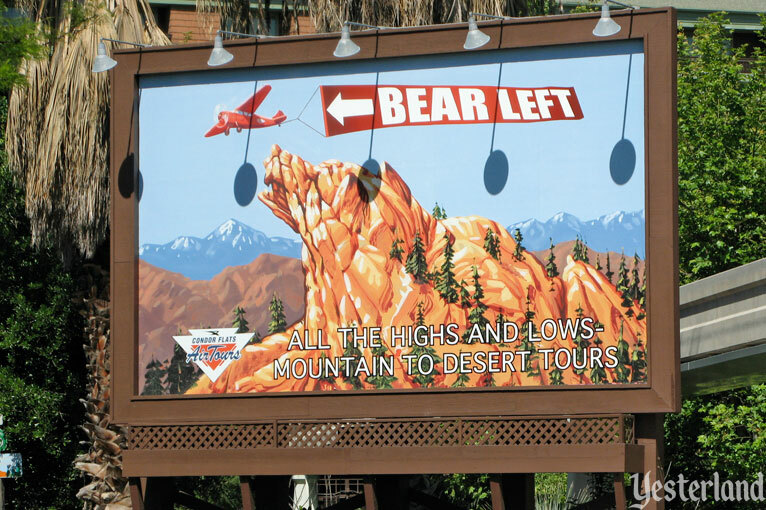 The “Bear Left” billboard was a fixture of Condor Flats since the opening of Disney’s California Adventure on February 8, 2001. The backstory above begins with the actual premise of Condor Flats, but then continues as a fabrication for this article. Condor Flats was supposed to look like a high desert airfield. Despite landscaping that included boulders, cacti, and palm trees, the space was too constrained and built-up. It did not make a convincing desert. The elevation and tall trees of Grizzly Peak did not help. It felt more like a mountain valley than the wide open spaces of Edwards Air Force Base or other desert airfields. 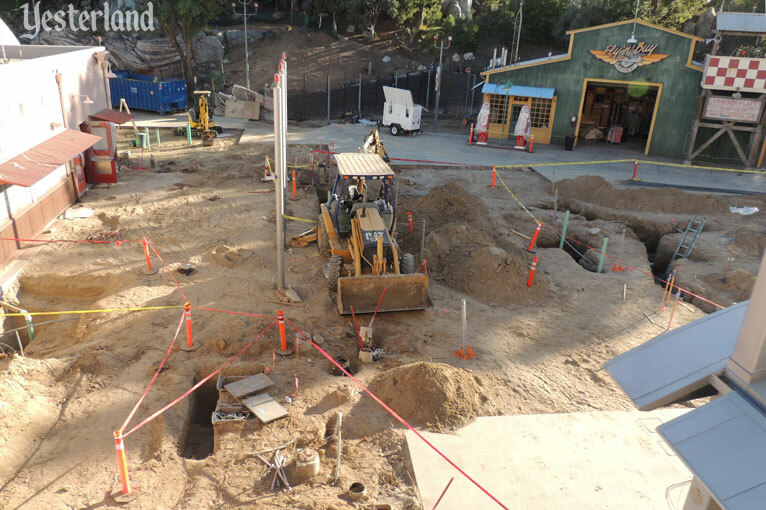 Condor Flats closed January 7, 2015 to begin an extensive renovation. 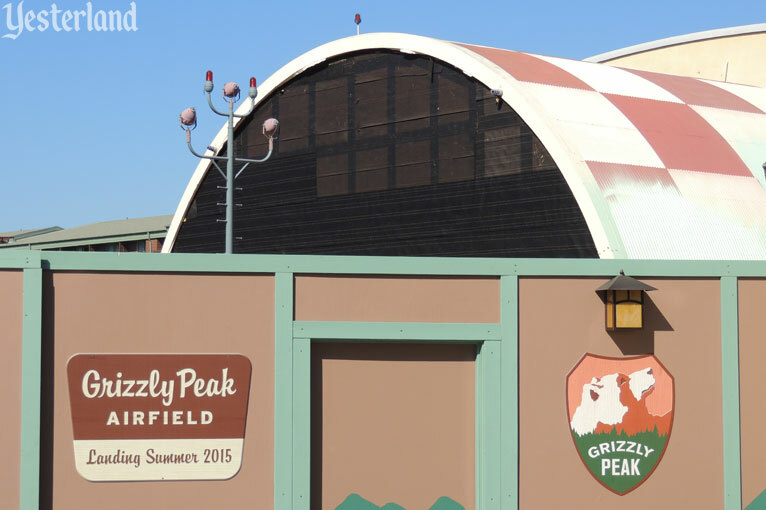 When the area reopened in stages through mid-May 2015, it had become Grizzly Peak Airfield. 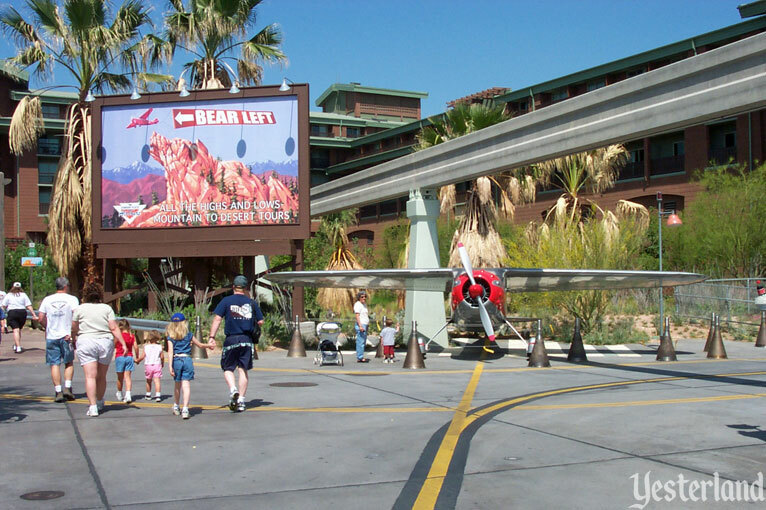 Although keeping its airfield theme, the Condor Flats name and high desert setting were gone. With new landscaping, the valley-like setting became more convincing as a mountain airfield than as a desert airfield. Existing structures were re-skinned to fit into the new setting. 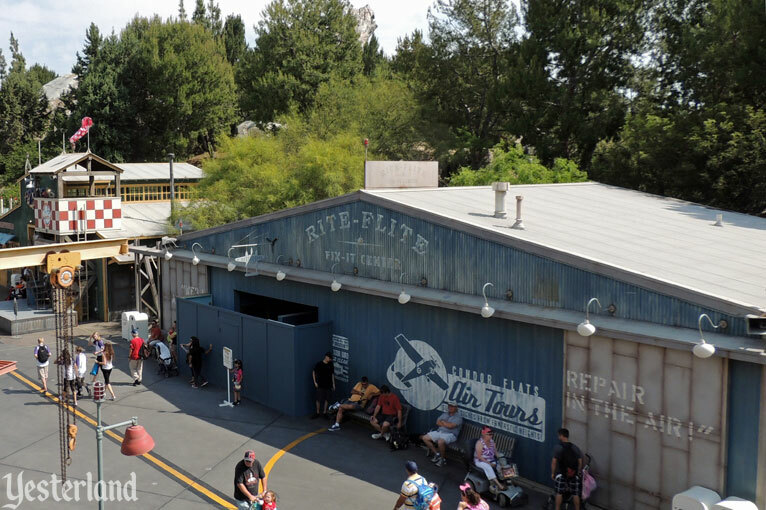 The airfield ties together seamlessly with Grizzly Peak as parts of the same land. The most industrial-looking features, such as those related to rocket engine testing, disappeared. 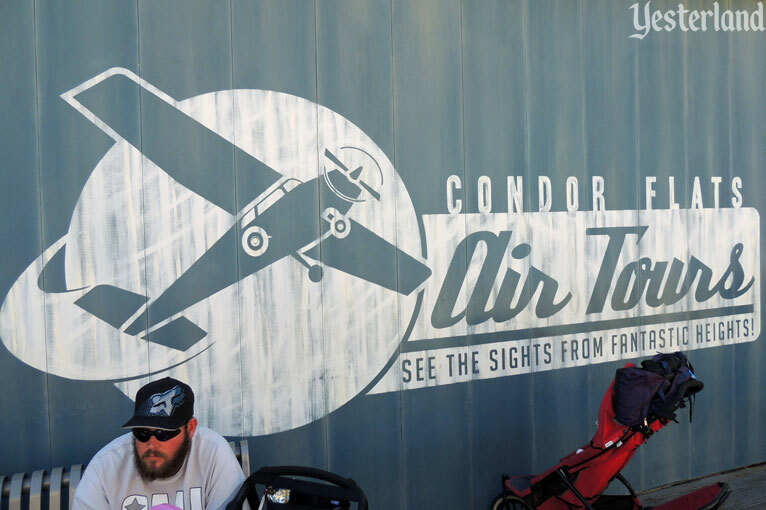 The airplane and hangars survived, but without the Condor Flats Air Tours branding. 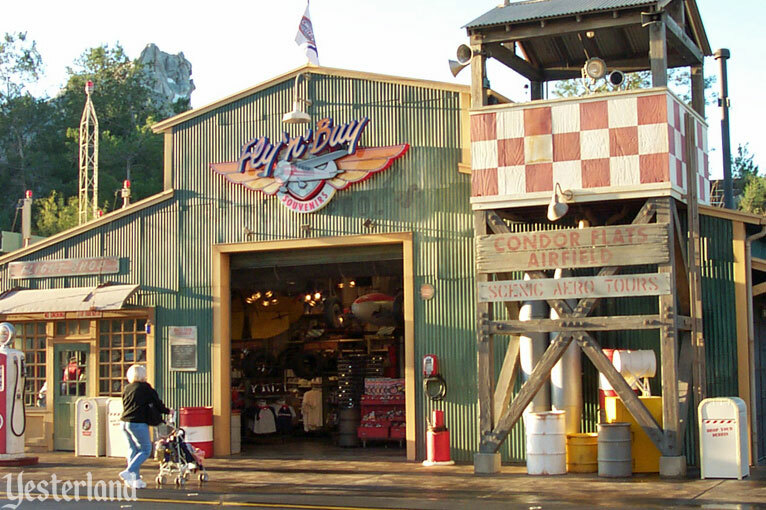 Fly ’n’ Buy became Humphrey’s Service & Supplies—with Condor gas pumps, a nod to the original theme. 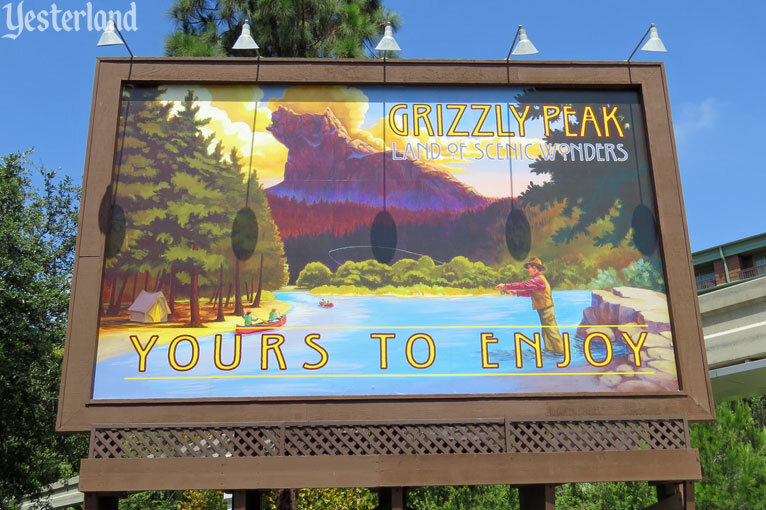 A billboard really doesn’t belong in a setting that takes its inspiration from National Parks—but Grizzly Peak never claims to be a National Park.